A 21-year-old Iranian student and human rights activist, Parisa Rafiei, has been sentenced to seven years by Branch 26 of Tehran's Revolutionary Court, her lawyer has disclosed. Speaking with the state-run Iran Students News Agency (ISNA), Saeid Khalili said her client was tried for assembling and collusion intended to commit a crime against the country's security, propaganda against the regime, and disturbing public order. Khalili tweeted that the "unjust" verdict was issued againstRafiei for joining a demonstration in December 2017 voicingstudents' demands and similar charges. Khalili said she hoped the court of appeal's verdict would lead to Rafiei's acquittal. A student of fine arts at Tehran University, Rafiei was detained by Islamic Revolutionary Guards Corps (IRGC) intelligence agents on February 25 and released on March 19 on bail. Earlier, Rafiei's aunt, Safieh Qarabaghi, had cited agents responsible for her niece's detention as saying, "Since Parisa has rejected cooperation with IRGC's Intelligence Organization, she should be deprived of her rights." Along with Rafiei, dozens of other students' rights activists have been sentenced in recent weeks. A student at Tabriz University and one of the students arrested for joining last December's widespread protest rallies, Roya Saghiri, was taken to the city's prison on August 25 to serve her 23-month term. Saghiri, who had publicly opposed compulsory hijab, published her own verdict on July 11 on her Instagram account. The court of appeal's judge upheld the primary court's verdict, finding her guilty of propaganda against the regime and insulting the state's highest authorities. The charges, vaguely defined, are usually used for political and human rights activists who have been recognized as "anti-Islamic Revolution" and "anti-state" dissidents by intelligence and judicial officials. According to the Human Rights Activists News Agency (HRANA), 24-year-old Saghiri had previously been sentenced to eight months for propaganda against the state and another 15 months for insulting Supreme Leader Ayatollah Ali Khamenei by the second branch of the Revolutionary Court in Tabriz. The trial of 25 students detained during the nationwide protests against the establishment has been held, the cultural deputy of the Science Ministry, Majid Sarsangi, reported on August 25. Twenty more students are still awaiting their trials, he added. In a statement published on July 23, 68 students' associations insisted that the people of Iran are suffering from a "myriad of dissatisfaction among people," and warned, "Authoritarian rhetoric intended to justify the country's shortcomings has directed Iran to a precarious route." 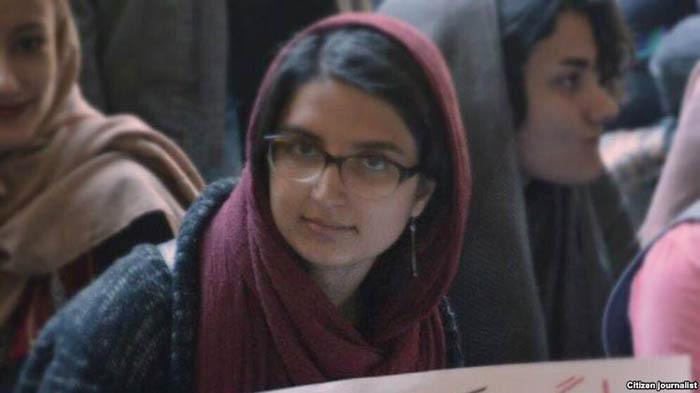 Referring to an earlier protest statement issued by 63 students' associations, the new statement said, "Totalitarian elements not only proved their reluctance to address students' demands, but they stepped further and sentenced a students' rights activist, Ms. Fereshteh Tousi." Thirty-year-old Tousi was sentenced by a Tehran court to 18 months in prison on July 3 on charges of propaganda against the state for organizing a ceremony commemorating the national students' day at Allameh Tababa'i University in December 2016. Since last March, 125 university lecturers and dozens of students' associations have called upon President Hassan Rouhani to intervene to protect student rights. During his presidential campaigns (2013-2017), Rouhani repeatedly promised to create a safe environment for students to freely voice their demands, concerns, and criticism. "Rouhani, who ran under the promise of citizens' rights, should direct the ministries under his supervision to halt these abuses against university students," said Sarah Leah Whitson, Middle East director at Human Rights Watch. "These are the young people who are so often extolled as essential to the country's future economic success." The uprising against corruption, poverty, and unemployment that broke out in December in the Shi'ite holiest city in Iran, Mashhad, soon turned into widespread demonstrations against the establishment and its highest authorities. The demonstrations continued for 11 days across the country, leaving at least 25 dead and more than 5,000 arrested.